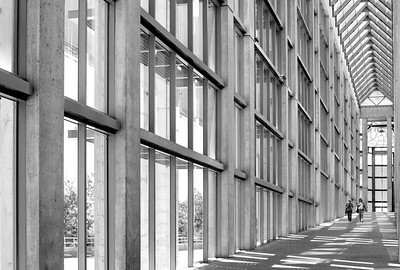 Landmarks, architecture and heritage images from Canada's capital region of Ottawa, Ontario. 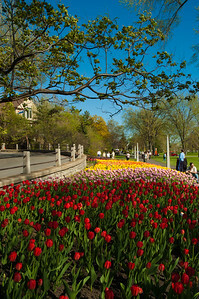 Colorful tulips line the roadside in a park in Canada's capital city of Ottawa Ontario. 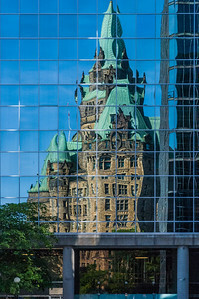 Reflection of the Confederation Building captured in the tiled windows of a nearby glass tower in Ottawa Ontario Canada. 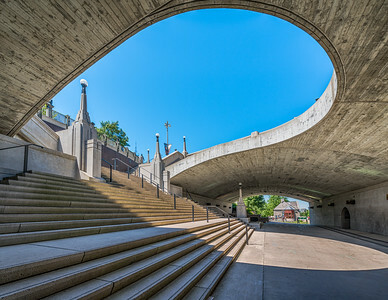 Architectural details of the overpass that spans the Rideau canal in downtown Ottawa Ontario, near the Parliament of Canada. 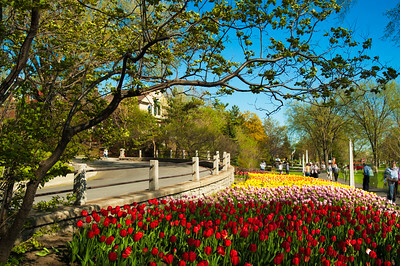 Tree with new bright green leaves overlooking Pink Lake in Gatineau Park, Quebec in late spring. 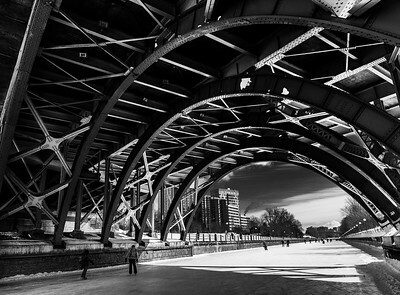 Ice skaters pass underneath the Mackenzie King bridge in Canada's capital city of Ottawa, Ontario in late winter. 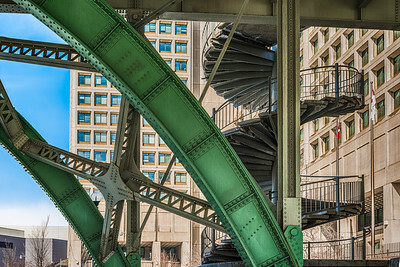 Abstract view of the girders and stairs underneath the Mackenzie King Bridge in Ottawa Ontario, Canada. 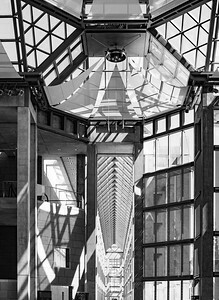 Abstract view of the National Gallery of Canada building in Ottawa Ontario, Canada. 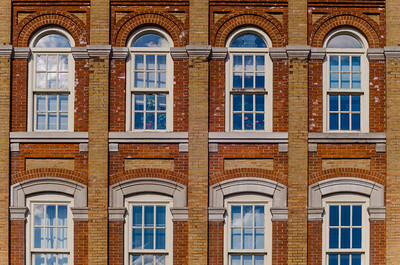 Graphic detail view of windows inset in a brick walled building in the ByWard market neighbourhood of Ottawa Ontario, Canada. 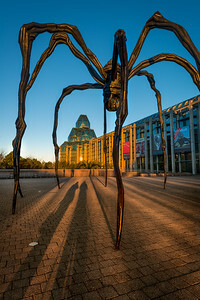 Artist Louise Bourgeois's gigantic spider sculpture entitled "Maman" ("Mother" in French) stands in front of Canada's National Gallery in Ottawa Ontario at sunrise. 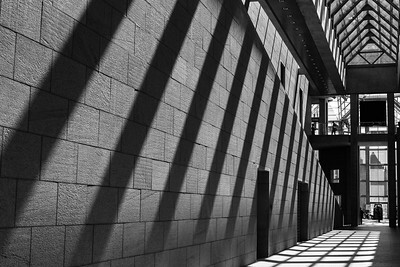 Shadows fall on the walls and floor of a hallway in the National Gallery of Canada. 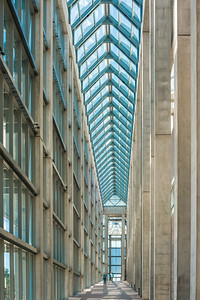 Ottawa Ontario, Canada. 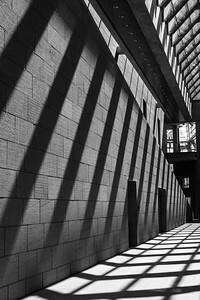 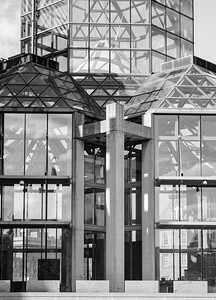 The complex architectural geometry inside the National Gallery of Canada building in Ottawa, Ontario Canada. 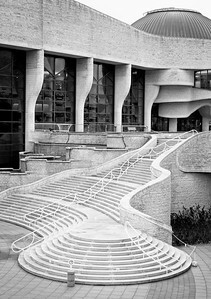 Cascading staircase at the Canadian Museum of History in Gatineau, Quebec Canada.